For most of this year, the Kandern autumn has seemed so dreary and colorless to me. I felt trapped in a constant cycle of rain, mud, and green-brown drab. It is funny how feelings—homesickness, loneliness, doubt—can shape not only our moods, but also how we see the world around us. This week, God has been teaching me an important lesson about patience and waiting on him. He is teaching me to look for signs of his faithfulness through even times when I don’t always feel that he is near. This Saturday, I received a special blessing from God. For some, it might have just seemed like a lovely day in October, but for me, it was a beautiful, tangible reminder of God’s love for me. He knew the aching in my heart to see blue skies, to feel the warm sunshine, and to see leaves begin to change color and decorate the trails with a blanket of red, yellow, and orange. He knew that I was missing memories of home in West Virginia. And so, God chose to give me a beautiful October Saturday—a day that can only be described as autumn at it’s absolute finest. To add another layer of awesome to this story, this wonderful Saturday just so happened to be the same day that Black Forest Academy was hosting the HOME cross-country meet and our team’s FINAL meet of the season. What a perfect way to end the season! 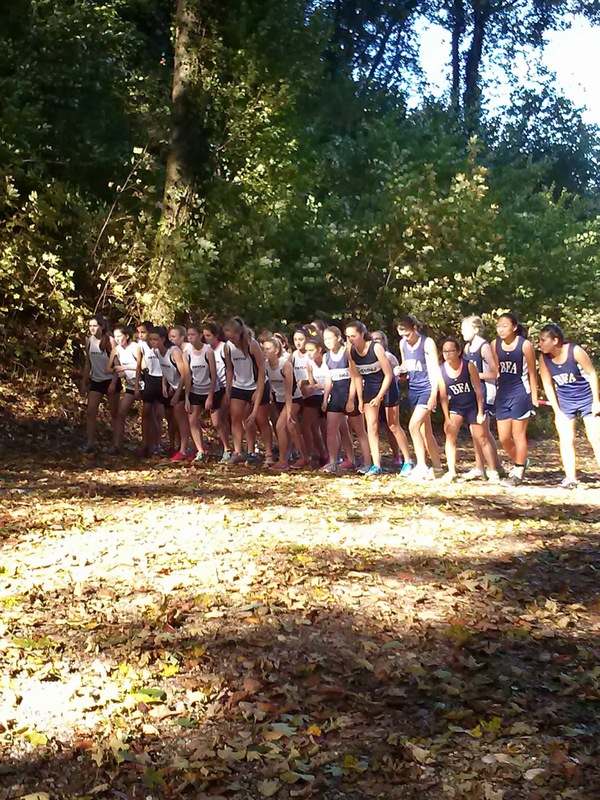 As you can probably imagine, hosting a cross-country meet is not an easy task. In fact, the amount of planning and preparation involved can be mind-boggling at times. (Hosting a track meet is much worse, so I really shouldn’t complain too much!) However, thanks to hard work of our head coach and all the terrific volunteers from BFA (including 2 of my roomies, thanks guys!) we were able to get everything accomplished on time. My task took longer than expected, considering the fact that I ran out of tape about halfway through the adventure and had to travel all the way back to the athletic van to find more. Even though it took a while, I loved the time to just be quiet, calm, and peaceful in the forest. It seemed strange that in about 2 hours the course would be bombarded with the footsteps of enthusiastic high school runners, but for now, the woods were just for me—quiet, serene, and filled with all the wonders of a fresh October morning. I finally completed marking the trail at about 11:00am, right around the time when my BFA runners were supposed to arrive at the course. The other schools had already set up their camps and had headed out on the traditional “course preview”— basically a chance for runners to walk the course and get a feel for the turns, hills, and terrain. The girls race was set to take place at 12:30pm, so we still had a bit of time to relax before warm-ups. After a warm-up jog, some drills, and a team prayer, my girls were ready to step up to the line. Hans Fung, the beloved academic dean of BFA, was the chosen to have the honor of firing the gun to start the race. So with a loud crack, a puff of smoke, and a big cheer for Team BFA, the girls headed out into the adventure of the forest in the fall. And thanks, God, for knowing exactly what I needed to bring me joy on this Saturday morning in Germany. Enjoying the run with Jesse and Hanna!